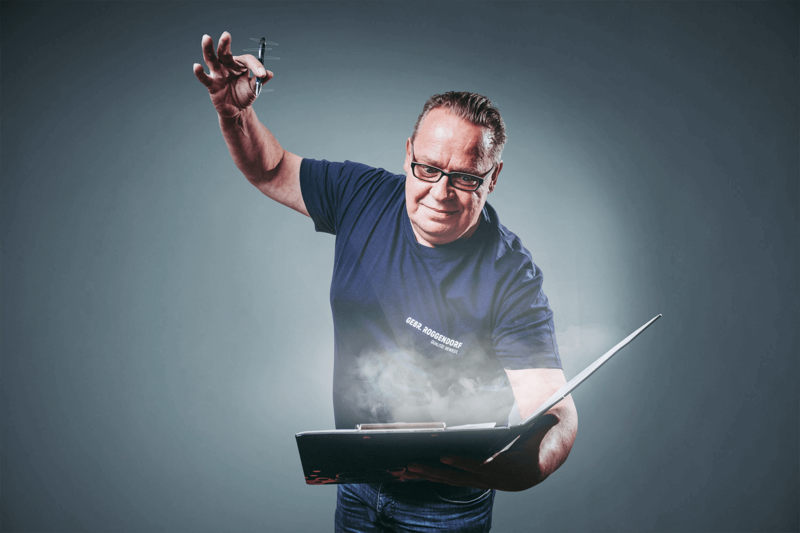 Job portraits | Roggendorf – Quality moves. He arrives at 6.30 am every morning, ready for action. Being only in his first year of apprenticeship at 35 is definitely unusual. Especially since he has already been working in the removal business for the past eleven years. He started his apprenticeship as a furniture, kitchen and relocation service professional (FKMU) after having worked at Roggendorf for six years. Thanks to his many years of experience in the industry, his training period is shorter than it is for real newcomers. Benjamin’s first steps into the removal business were a bit of a coincidence: his stepfather offered him a job at his own removal company after he graduated from commercial college. True to the industry motto ’Once a mover, always a mover!’, his interest was immediately sparked, and he is now firmly rooted in the job. Labelling Benjamin Stecher as ’just’ an apprentice would not do him justice. He is so much more. He already got his truck driver’s licence back when he was still working for his stepfather. Since then, he has mainly been working in the field. “My steering wheel is my office. Sitting in an office every day just wouldn’t be for me,” said Benjamin. The man from the Harz mountains (Lower Saxony) already has quite a number of kilometres under his belt and has travelled to many European countries as part of his job, including England, France, Italy, Sweden and the Netherlands. The longest distance he has travelled for a single relocation is quite something: he drove his lorry a total of 4,300 kilometres from Cologne to Milan to Stockholm and back to headquarters. Meanwhile, things have quietened down a little for him, and he mainly drives across North-Rhine Westphalia and Germany. But there is lots of work there, too. On top of his vocational training, Benjamin has also just completed a course that qualifies him to be a team leader. This means he is now responsible for organising and coordinating smaller and medium-sized projects such as archive, office, employee and private relocations. But most of the time the job is not finished after everything has been packed and taken to its new home: the dismantled items need to be reassembled. Benjamin enjoys this part of his job, too, even though it often comes with certain challenges. Special and ever changing customer requirements need to be taken into account. In such cases, creative solutions and quick and confident work are what’s needed. He sometimes even offers to help out as “room design consultant” – as he calls himself – when customers are undecided. Due to his many interests and years of experience in many areas, he is considered a true Roggendorf allrounder. Driver, team leader, fitter or packer – the talkative mover enjoys every aspect of his job. What’s important to him is that it remains varied. Switching sector or his employer is out of the question for Benjamin Stecher. The high quality of work and skill of all our employees is what he particularly likes about Roggendorf. “Here, everyone looks out for everyone else,” said Benjamin. “Roggendorf shows consideration for personal matters and has a flexible way of dealing with employees.” He feels visibly comfortable in his work environment and knows he is a valued member of the Roggendorf family. The ’We can do it!’ mentality suits him well. Jürgen Grzegorek has followed his passion for furniture for the past 40 years. Born and raised in Oberhausen, he now lives in the Rhine metropolis of Cologne. Since he applied for a job at Roggendorf 20 years ago, he has become a valued colleague, and it is practically impossible to imagine a time without him. At the end of the eighties, the master packer completed a course to become a training instructor – ever since, he has been responsible for supervising our trainees. In 2005, he was officially appointed training instructor at Roggendorf. Although it is physically demanding, he loves his job: “It’s not an easy job, but if you’ve been at it for as long as I have, you’re sure to enjoy it,” said Jürgen. Of course, he not only trains up-and-coming young talent, but also manages projects. And he always pitches in to help. New challenges arrive on a daily basis. “Every day, you get to know new people, and often you get to see furniture you’ve never seen before,” he explained. His colleagues and superiors value Mr Grzegorek most highly. His constant and humble character underline his great skill. He is a man you listen to. What he says, matters. His voice is calm and patient. Of course, 40 years’ experience in the removal business speaks for itself. The trainees, too, all rave about their trainer. As an authority figure, he is both respected and seen as a friendly and polite teacher. Often, he takes the trainees aside and takes the time to explain processes they are not yet familiar with. Patiently and competently, he teaches and shows them important aspects of the job. But he also makes sure the learning environment remains respectful, especially when banter is in danger of turning ’too rough’. He guarantees a steep learning curve for his protégées and always keeps things friendly and respectful. The atmosphere and the intriguing challenges that come with working at Roggendorf inspire him to turn up for work on time every day and to stay until his day’s work is done. Trainee Sebastian Wolniok is 19 years of age, communicative, likes to pitch in, and is now in his third year of apprenticeship at Roggendorf. Born in Tarnowitz, Poland, he came to Germany when he was four years old. At home, he still speaks Polish, everywhere else, German. This means he has two mother tongues, and on top of that, he is practically fluent in English. He learnt English from watching films and playing computer games in their original language – this is a huge help when dealing with international customers. Above all, Sebastian loves the variety of jobs he is involved in every day. Every day, everything is new: new situations, new customers and, consequently, new wishes and requests. Apart from physical fitness Sebastian has one of the most important skills you have to have when working in the moving business: tact and people skills when dealing with customers. “Different customers do, of course, have different ideas. So, sometimes you have to slip into the role of advisor or counsellor,” said Sebastian. You need to reassure the customer so that they emerge unscathed from the stress of relocating. Not everyone finds it easy to trust other people to handle their possessions. In such a situation, Sebastian likes to show total commitment, which helps dispel the customer’s worries. “You just need to listen to them and be understanding. I would be similarly anxious if I had to move,” he said. In May 2018, Sebastian will take his final exam and become a fully qualified furniture, kitchen and relocation service specialist (FMKU) – his plan is to stay with Roggendorf. He feels comfortable here and likes the typical working atmosphere. Most important for him is how cooperative and friendly his colleagues are, which results in good and reliable collaboration. He can imagine becoming team leader one day. After all, he has already supervised and coordinated a number of smaller projects. And thanks to his outstanding English language skills, he already had to act as interpreter during an international assignment. A few years ago, he would never have dreamed he would get this far. Sebastian Wolniok became a lot more confident over the course of his training and learned to stand his ground. This transformation has not gone unnoticed by his superiors, either. He knows his time at Roggendorf completely turned his life around – and for this, he is thankful. Carsten May joined the Roggendorf team in the middle of 2016, bringing with him the skills and knowledge of two completed apprenticeships. Born near Frankfurt, the 30-year-old moved to Pulheim to start his job as a dispatcher. But let’s start at the beginning: in 2013, he completed his apprenticeship to become a furniture, kitchen and relocation service specialist (FMKU). However, that was not enough for him, which is why he then embarked on another apprenticeship to become a logistics manager. He completed his training in 2016. After all this education and practice, it was now time to give it his all at Roggendorf. Carsten May remembers his job interview well: “All three managers, Walter and Manfred Roggendorf and Stephan Strauss were present,” said Carsten. After a short chat, they knew he would fit in well, both on a personal and professional level which is why he could sign his employment agreement that very same day. Incidentally, Yvonne Tögel recommended him, which is how the interview came about in the first place. She was Carsten’s former supervisor and knew his skills, so she recommended him to Roggendorf. Today, they both work for Roggendorf and have become firm friends. This is something that Carsten May likes a lot about his job: the environment is friendly and honest, which means that many employees are also friends outside of work. Carsten mainly works in dispatch. Every day, he coordinates the teams and distributes the assignments. His job also includes cost optimisation and planning shifts and logistics. He is well-respected as a supervisor and coordinator, precisely because he also has a background in FKMU. And whenever they are one man short, he steps into the breach and lends a helping hand. Having that expertise in the trade on top of being a logistics manager makes him all the more authentic as a supervisor. Roggendorf is a family business – and that’s something you sense immediately. We are one big family. Everyone gets a second or third chance. As everyone has an open ear for their colleagues, problems are quickly identified, and people are understanding when someone is struggling. Carsten will remember a trainee, who was almost fired. But despite his many absences, we never lost hope in him, and it paid off. The young man managed to get his act together in the end. With so much support, respect and joy, Carsten May enjoys coming to work – and gladly stays until the day’s work is done. Yvonne Tögel already knew she wanted to train as a logistics manager the day she finished school. Born and raised in the peaceful town of Reutlingen near Stuttgart, she completed her apprenticeship in the south of Germany in 2008. After four years working in dispatch in Berlin, she moved to Hesse, where she worked as relocation coordinator for two and a half years. Then, in 2015, she started as ‘move coordinator’ at Roggendorf – already with 10 years’ professional experience. As move coordinator, she ensures that all our relocations go smoothly. Her focus now lies on international projects. The phone never stops ringing, people keep knocking on her door, and her inbox is never empty. Her work is fast-paced and urgent. But it makes her feel so alive. She is in an industry, where every day is different, and anything can happen. “Everything has to work,” the Swabian explains and seems totally calm: “You need to develop a kind of inner serenity in this job. You get that after a while.” And indeed, you quickly realise that she has the skills to coordinate major international projects: highly communicative, stress-resistant and solutions-oriented, she is ready to face any challenge. Yvonne shares her office with Carsten May, whom she helped recruit a couple of years ago. Thanks to her recommendation, Carsten got an interview with the three managers. Yvonne gets on extremly well with May but her meticulous manner can sometimes be a bit of a curse, she admits. She spots many mistakes and never forgets. ”Some colleagues find that exasperating at times,” said Yvonne, but she nonetheless gets on incredibly well with everyone. Yvonne loves the friendly atmosphere at Roggendorf: people respect and value one another. From her previous appointments she knows this is not the norm. Roggendorf manages to balance commercial efficiency with a cooperative friendly atmosphere. Kevin Bongartz got his job at Roggendorf eight years ago almost by accident. An employee had told him about the business, and, intrigued, he wrote his application that very same day. After a short interview, Kevin received a phone call asking if he could start the following Monday. He began as a temp, but by December 2010, he was offered a permanent position. Ever since, the man from Cologne knew this was where he wanted to stay. “I sort of stumbled into my job. I used to want to be a fireman or a professional footballer,” was how the level-headed relocation expert described his start at Roggendorf. But he has never regretted his decision. A few months after getting the permanent position, he decided he would like to become a furniture, kitchen and relocation service specialist (FMKU) – and in January 2015, he completed his training. Day-to-day work is very varied. “As relocation specialist, you engage in logistic processes, do carpentry and electrical engineering or even set up a whole kitchen, if that is what the customer needs,” explained Kevin. He and many of his colleagues agree on one thing: no days are the same, and there are always challenges. “Private relocations are especially exciting. You get to know all sorts of customers and get to deal with their individual requirements and worries,” the 29-year-old explained.” His calm manner is an advantage when dealing with customers – especially when they are tense about the transport of valuable belongings. Listening to Kevin Bongartz chatting about his job, you know that he is passionate about what he is doing and that he takes the fears of worried customers seriously. He deals with many important issues during a move – but assembling kitchens is what he loves best. Calmly and with a smile on his face, he works until he has reached perfection, and the customer can breathe a sigh of relief. Before he started his career at the family business, he once participated in a trial game for the football club 1. FC Köln. In his spare time, Kevin still supports his favourite team as much as he can and closely follows the Bundesliga in general. He plays less football these days, but he still makes sure he keeps in shape and regularly goes to the gym to train. Kevin still likes to reminisce about a particular work highlight: when Roggendorf relocated the Robert Schuhmann Institute, he got to spend three weeks in an exceptionally summery Belgium. He relished the interesting tasks – such as moving a carpentry workshop – and revelled in the spectacular weather. “Working outside in 25-30 °C is a lot more fun,” said Kevin with a smile. That is one of the perks of working for an international business: you get around and see a lot of Europe. Another project took him to Nice in the sunny southeast of France for three days. The 29-year-old obviously enjoys his work – whether it involves expertly taking apart pianos for a move, assembling kitchens or carrying furniture up to the seventh floor. He tackles his tasks in a practised and reliable manner and faces each new challenge with confidence. He may have stumbled into this job by accident – but he is very certain that he wants to remain with Roggendorf indefinitely.